The exchange of offensive diplomatic notes and statements, mutual expulsions of diplomats point to objective long-term problems in relations between Russia and Greece. Andreas Friganas, the Greek Ambassador to Russia, was summoned to the Foreign Ministry on Monday, where, according to the Foreign Ministry, "he received a note informing about the Russian side's mirror measures in response to the unfriendly actions of Athens in July this year against Russian diplomats and citizens ". Then, as reported, the Greeks announced the expulsion of two Russian diplomats and the refusal to enter the country two more. They were accused of "disrespecting" the Greek state: interference in its internal affairs, in particular, attempts to bribe religious figures, officials, police and even the military, sending "spies in the cassocks", trying to organize demonstrations against the settlement of the "name dispute" between Greece and Macedonia, which opens before the latter the way to the EU and NATO. In Moscow, for their part, they accuse Athens of being an instrument of Western provocations against Russia, destroying the centuries-old relations between the two peoples, including in the cultural and religious spheres. The problem in the case of Greece is not only that its current government is waging a persistent and methodical war against Orthodoxy, but rather that its financial and economic survival now depends not on Russia. It depends on the opponents of Russia, leading a global hybrid war against it, to which Greece has also been drawn. On the other hand, in Russia, with all sympathy for the Greeks and Orthodoxy, they see that nothing depends on Athens in the modern world, that the Greeks do almost everything under the dictation of Western countries, sometimes rioting to amuse their pride in trifles. It should be recognized that Russian-Greek relations, even in a purely religious sphere, have never been cloudless and sometimes overshadowed by serious contradictions. For example, the extremely negative reaction in Greece to the ideology and policy of pan-Slavism in the XIX century. Or rivalry for Constantinople. Yet the Greeks are probably the only people in Europe whose representatives have never fought against Russia, which tried to help in difficult times. Echoes of great sympathy for Russia can still be found in Greece today among the older generation. But the younger generation is brought up in a different way. Combined with external factors, this largely explains why Russian-Greek relations were reduced to tourism, as well as to the pilgrimage to which Athens began to obstruct. Meanwhile, all the planned major Russian-Greek economic projects of recent years have not been realized. This should not be surprised. For 10 years, Greece has been experiencing a severe financial and economic crisis, unprecedented for a European country in peacetime. Since 2010, Western creditors have spent over 300 billion euros on financing Greece. And although this led to absolute dependence, Greece would simply be lost without the financial resources provided to it. Russia did not have that kind of money. Greece - a small country, which in the modern world simply can not be really independent. Her membership in the EU and especially in NATO imposed additional restrictions on the authorities. Because of this, sometimes one had to sacrifice real national interests, choosing the lesser of two evils. Of course, the proud Greeks tried not to show this, but all attempts to conclude beneficial deals with Russia on buying Russian-made losses, ports, railways and leading gas companies of the country failed. At the last moment, the negotiators from the Greek side were bred and privately admitted to their Russian counterparts that they are not allowed to do this by Brussels and Washington. Businessmen and companies from Russia were not allowed to privatize anything in Greece, except for a couple of collapsed hotels, tobacco factories and a football club. 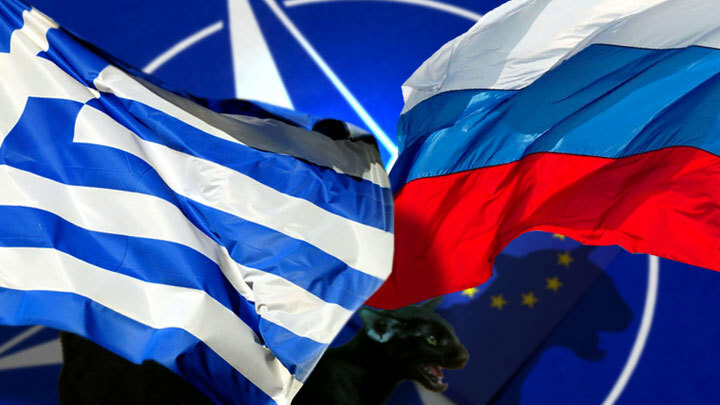 However, recently there have appeared some new problems, extremely inconvenient for Russian-Greek relations. In the waters of the Aegean Sea, which Greece rightfully considers to be its own, but also claimed by Turkey, significant reserves of energy have been found. Greece can not develop these deposits in the face of Turkey's saber-rattling weapons alone for military and financial-technological reasons. It needs a strong partner country, with which it is ready to share the energy riches. Greece has chosen France for this, which has money, technology, fleet and have no serious business with Turkey. Greece is also suspected that, in the light of the EU's readiness to receive gas from the Turkish Stream, the branch from it will go not to Greece, but to Bulgaria, which is much more profitable for the countries of Central Europe. There is another very important defense-strategic moment. The agreement on the supply of the Russian anti-aircraft missile system S-400 for Turkey coincided with the aggravation of Russian-Greek relations. This is hardly an accidental coincidence, since the appearance of this unique air defense system in Turkey is able to close not only the sky of this country for Greek military aviation, but also that part of the Aegean Sea, which the Turks claim. Greece, despite all the difficulties it is experiencing, is in second place in NATO after the US in terms of defense spending to GDP. A significant part of these scarce means is consumed by aviation, which with the advent of the S-400 Turks actually becomes (in the event of a military conflict with their main enemy) almost useless. Greek fighters are constantly confronted with the boldly leading Turks over the Aegean Sea, staged battles between pilots of the Air Force of both countries have more than once developed into real ones, there are dead pilots and downed planes from both sides. And now all this can radically change. The Greeks know that the S-400 is an excellent system, because the Russian S-300s, which guard the Greek sky and at the same time the NATO bases in Crete, have been quietly used for a long time. This happened after they took this Cyprus-bought air defense system for themselves after the Turkish protests. All of the above is, perhaps, the true background of the aggravation at the initiative of Athens of Russian-Greek relations. And it's not that Russia allegedly bribed some Greek monks, priests and special services, intrigued in Greece against the admission of Macedonia to NATO. Of course, Moscow, for understandable reasons, is against the expansion of NATO. It does not hide this. But Macedonia will not strengthen the alliance, but will make this bloc even more unwieldy. Thus, the crisis in relations between Athens and Moscow is much deeper than usually everyone thinks. Each of the parties does what it considers to be advantageous, despite the negative side effects.